On Saturday, September 15, 2018, MUFON Delaware has launched its new Meetup page. Come join us at Meetup. GEOMAGNETIC STORM PREDICTED: NASA’s Solar Dynamics Observatory is monitoring a large hole in the sun’s atmosphere, now directly facing Earth. 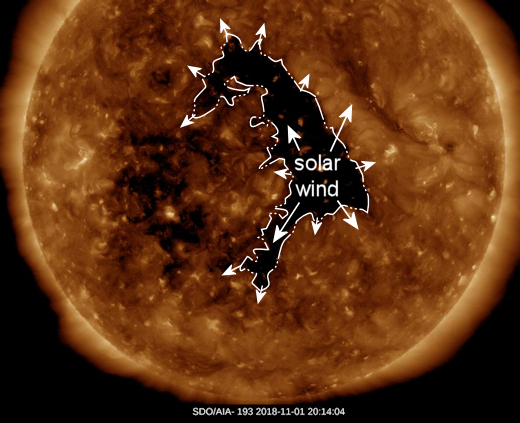 A stream of solar wind escaping from the opening is expected to reach our planet during the late hours of Nov. 3rd, likely sparking minor G1-class geomagnetic storms over the weekend. Visit Spaceweather.com for more information and updates. Below —- This false-color extreme ultraviolet image from NASA’s Solar Dynamics Observatory shows a coronal hole spewing solar wind toward Earth. Elements in the noncore parts of our planet, called the “bulk silicate Earth,” can intermingle with each other, but they never interact with the elements of the core. Though some volatiles existed in the core, they couldn’t make their way to the planet’s outer layers. And then a collision happened. But there’s just one problem: the ratio of carbon to nitrogen is off. While the meteorites have about 20 parts carbon to one part nitrogen, Earth’s noncore material has about 40 parts carbon to each part nitrogen, according to study author Damanveer Grewal, a fourth-year Ph.D. student in the Department of Earth, Environmental and Planetary Sciences at Rice University in Houston, Texas. So, the study authors’ group decided to test another theory: What if another planet brought the goodies? “Earth could have collided with many different kinds of planets,” Grewal told Live Science. Could one of those planets have given the bulk silicate Earth the correct proportion of elements?